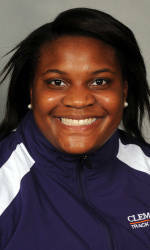 Waller was outstanding in the women’s weight throw on Friday at the Virginia Tech Elite Meet. The sophomore out of J.L. Mann High School in Greenville, SC was runner-up with a personal best 68’2.5″. Her mark is now second on the Tigers’ all-time performance list.